The PurFlo Breathable Nest is a multi-functional, air permeable and hypo-allergenic baby bed. Made from a combination of 100% soft cotton and an anti-bacterial 3D mesh you can safely put your little sleepyhead down to rest anywhere. PurFlo is the market leader in breathable baby nests. The materials have been specifically sourced for their air permeable and anti-bacterial properties. Conforming to UK Standard BS4578 the PurFlo Nest’s bumper and mesh base are certified not to restrict your baby’s airflow in anyway giving you complete peace of mind. PurFlo chose to use Amicor Pure filling in their bumper not only because it is naturally breathable but also because it is anti-fungal, anti-bacterial and reduces the exposure to dust mites; all of which are known to aggravate infant allergies such as childhood Asthma or Eczema. 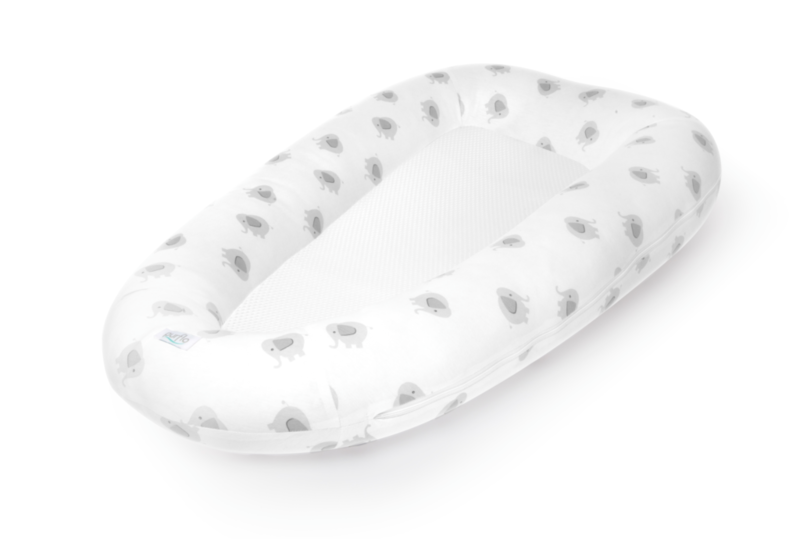 The PurFlo Nest can be used as a crib insert, when co-sleeping, for tummy time, around the house: awake or resting as well as a portable travel bed when visiting family and friends. All materials are fully air permeable, anti-bacterial and naturally flame retardant providing your newborn with an entirely non-toxic, chemical free, safe place to rest. With hygiene in mind the PurFlo Nest features a removable and machine washable cover. Additional covers are available so you can have one on and one in the wash.
We can’t rave highly enough about this fantastic sleep aid from PureFlo. The clever sleep nest was an absolute hit with our little tester. Designed to make your little one feel cocooned it is the perfect place for little ones to sleep, either overnight in their cot or for nap times anywhere around the house. It is so versatile and really light so can easily be carried from room to room. Designed with safety in mind the breathable fabrics give you peace of mind that your baby will be safe wherever you put them down to sleep. We love the fact that the covers are washable, so if you have any accidents you can whip them off and throw them in the washing machine.